Below are some highlights of the many reasons why you want to take Koncentrated K. It offers 3 different types of vitamin K at doses high enough to be therapeutic. It gives you enough vitamin K for your body’s basic needs, with additional vitamin K to be distributed to the rest of the tissues in your body that need it. It is the only product on the market offering a therapeutic dose, and it is the only product with a value price. 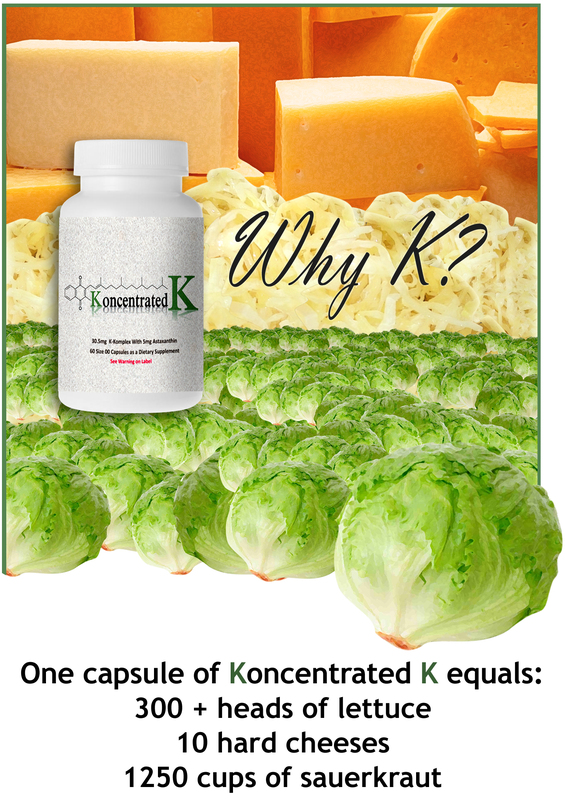 The different vitamin K’s clear from your body at different lengths, and the Koncentrated K formula ensures that you always have enough vitamin K available. Plus, the astaxanthin in the formula is the most powerful antioxidant available. * Vitamin K is known for clotting your blood, but research indicates that it is vital to the health functioning of many tissues in your body. * Research shows that a prolonged vitamin K deficiency is a risk factor for osteoporosis, atherosclerosis, Alzheimer’s and cancer. Present recommendations for daily intake are based on what your body needs to prevent bleeding. The current recommendations for daily intake do not take into account what the rest of your body needs. * Research indicates that the vitamin K intake of the general population is too low, and that most people test as being deficient in vitamin K.
* Vitamin K is not toxic at any level. Some folks have taken doses as high as 45 mg a day, with no adverse effects. It appears that your body uses all that it gets. There are no recommended daily allowances, as there are no upper limits, meaning you can take high doses without worry. * Vitamin K is associated with many health benefits. Research has greatly expanded in the last decade, and vitamin K is associated with reversing cardiovascular disease, with strengthening bones, with interfering with the growth of cancer cells, with benefitting those with chronic kidney disease, as helping regulating insulin in diabetics, and more. * Vitamin K2, or menaquinones, have been found to improve mitochondria functioning in cells. Mitochondria are unique structures in the cells of people. They serve as batteries, generating energy and powering the cell and the body. They also synthesize and package proteins for transport to different parts of the cell and beyond, and contribute to neurological functioning. Damaged mitochondria have been implicated in such diseases as Parkinson's Disease, cancer, Alzheimer's Disease, and ALS, a progressive neurological disease that impairs nerve functioning to the muscles. (Schapira, 2006; Alam, et al 2016, Seyfried, 2015; Anandatheerthavarada et al 2003; Devi et al 2006; Manczak et al 2006; Reddy & Beal 2008; Martin et al 2007; Martin et al 2009). * Research indicates that MK4, a menaquinone, improves the functioning of mitochondria and can alleviate defects that impair mitochondria function. Studies showed that vitamin K2 'rescued' mitochondrial dysfunction, and restored normal function (Vos, et al 2012). * Koncentrated K is formulated to give you high doses of three types of K = vitamin K1, MK7 and MK4, along with Astaxanthin, a powerful antioxidant which helps fight inflammation. Koncentrated K can be taken once or twice a day, so that you always have adequate amounts of vitamin K in your body at all times. * There is a vitamin K family, including vitamin K1 also known as phylloquinone, and vitamin K2s, also known as menaquinones. In the K2 family, MK7 and MK4 are the most widely researched. * Research has highlighted the vitamin K family as being key regulators of calcium in the body. Research has identified proteins in most body tissues that are dependent on vitamin K, in order to be effective. Without vitamin K being available, calcium is misplaced and becomes part of a disease process. * Vitamin K triggers a modification in some proteins in your body, making them carboxylated and involved in disease prevention. Carboxylation is a good thing. * Vitamin K1 can be found in green leafy foods, though in very small quantities, and is poorly absorbed. It is impossible to eat enough fresh vegetables on a daily basis to get the same amount of vitamin K as Koncentrated K provides. The photo above is an attempt to illustrate how much food one would have to eat daily, in order to get the same amount of vitamin K that comes in the Koncentrated K capsule. * Most physicians focus on prescription medications and are not familiar with nutritional supplements that aid in disease prevention and disease reversal. It is not part of their medical education typically, hence they rarely suggest it or recommend it for your health. Cardiovascular disease affects millions of people around the world. It is the leading cause of mortality in the western world. The major underlying disease is atherosclerosis. Current medical treatments are often invasive and surgical, and medications can have toxic side effects. Vitamin K is not known to be toxic. * A key vitamin K dependent protein is matrix Gla protein (MGP), and is the most important inhibitor of arterial calcification – or of plaque build up in arteries. Mice who have been genetically bred without MGP die within weeks due to rupture of their arteries. * Gla needs an adequate amount of vitamin K available in order to function effectively and inhibit calcium. If Gla has enough vitamin K available to it, it becomes ‘carboxylated’. This is desirable, as it means that your body has enough vitamin K for health. * Research has measured Matrix Gla Protein in the body and low amounts of Gla are correlated with high arterial calcification scores – a key measure of the extent of heart disease, meaning most folks with heart disease are also vitamin K deficient. * It is now understood that atherosclerosis and heart disease are part of the vascular-bone axis, and can result from dysregulation of calcium in the body – rather than going to bones and teeth, etc, it ends up in veins and arteries. * Peer reviewed scientific research indicates that adequate amounts of vitamin K can reverse heart disease. Research has identified several ways that carboxylation can be disrupted, meaning that heart disease can begin. People with these events should take vitamin K.
1. antibiotics can affect the bacteria in your gut, interfering with the metabolism of vitamin K from food. 2. vaccinations can have the same effect. 4. medications such as warfarin, or coumarin, which is prescribed for blood clots. Warfarin interferes with vitamin K and people taking warfarin often develop heart disease as a result. Globally it is estimated that one in three women and one in twelve men over the age of 50 will suffer from osteoporosis in their lifetime. In the United States, 10 million people have osteoporosis and 18 million have osteopenia, a milder condition that precedes osteoporosis. * Bone is a living tissue, continuously recycling and reforming and about every three to five years your bones are newly reformed. both osteoporosis and osteopenia, the bone cycle has been disrupted, by something like a reduction in vitamin K in the body, or other disease processes. * The vitamin K family play an important role in bone metabolism and bone health. Matrix Gla Protein (Gla), depends on vitamin K in order to be effective, and at least three bone proteins containing Gla have been identified, including osteocalcin, matrix Gla protein and protein S.
* Research shows that adequate amounts of vitamin K are needed in order to activate osteocalcin, a protein in the body responsible for making bones stronger. * Research shows that bone fractures are reduced when vitamin K levels are higher. And that brittle bones and low bone mineral density are caused by what is called under-carboxylated osteocalcin, meaning the osteocalcin did not have enough vitamin K.
* Research shows that warfarin, taking to prevent blood clots, is associated with brittle bones, due to its interference with vitamin K.
* High doses of vitamin K2, specifically MK4, are an approved treatment for osteopososis in Japan. Research shows that when taking a supplement of vitamin K, bone loss is reduced. Anandatheerthavarada HK, Biswas G, Robin MA, Avadhani NG. Mitochondrial targeting and a novel transmembrane arrest of Alzheimer's amyloid precursor protein impairs mitochondrial functionin neuronal cells. J Cell Biol. 2003;161:41-54. Their results showed that APP (amyloid precursor protein) is targeted to neuronal mitochondria under some physiological and pathological conditions. Devi L, Prabhu BM, Galati DF, Avadhani NG, Anantheerthavarada HK. Accumulationof amyloid precursor protein in the mitochondrial import channels of human Alzheimer's disease brain is associated with mitochondrial dysfunction. J Neurosci. 2006;26:9057-68. Mitochondria are the major source of energy for the brain. Oxidative damage, induced by amyloid beta is associated with mitochondria early in Alzheimer's disease progression. There is increasing evidence suggesting that synaptic damage from the import of AB into mitochondria play a significant role in aging and AD development. Manczak M, Anekonda TS, Henson E, Park BS, Quinn J, Reddy PH. Mitochondria are a direct site of Aβ accumulation in Alzheimer's disease neurons: implications for free radical generation and oxidative damage in disease progression. Hum Mol Genet. 2006;15:1437-49. Alzheimer's is a complex, neurodegenerative disease characterized by the impairment of cognitive function in elderly individuals. Their findings suggest that early therapeutic interventions targeted to mitochondria may be effective in delaying AD progress in elderly individuals and as a treatment for folks with Alzheimers. Schapira AHV. Etiology of Parkinson's disease. Neurology. 2006;66(Suppl. 4):S10-23. Martin LJ, Liu Z, Chen , Price AC, Pan Y, Swaby JA, et al. Motor neuron degeneration in amyotrophic lateral sclerosis mutant superoxide dismutase-1 transgenic mice: mechanisms of mitochondriopathy and cell death. J Comp Neurol. 2007;500-20-46. Their study identified novel mechanisms for mitochondriopathy and motor neuron degeneration in ayotrophic lateral sclerosis mice. Reddy PH, Beal MF> Amyloid Beta, mitochondrial dysfunction and synaptic damage: implications for cognitive decline in aging and Alzheimer's disease. Trends Mol Med. 2008;14:45-53. Mitochondria are the major source of energy for the brain. Oxidative damage, induced by amyloid beta is associated with mitochondria early in Alzheimer's disease progression. There is increasing evidence suggesting that synaptic damage from the import of AB into mitochondria membranes play a significant role in aging and AD development. Martin LJ, Gertz B, Pan Y, Price AC, Molkentin JD, Chang Q. The mitochondrial permeability transtion pore in motor neurons: involvement in the pathobiology of ALS mie. Exp Neurol. 2009;218:333-46. Amytrophic lateral sclerosis (ALS) is a fatal neurodegenerative disease of motor neurons that causes paralysis. Mitochondria in motor neurons might be key sites for ALS pathogenesis. This study tested that hypothesis and their results demonstrated that mitochondria have causal roles in the disease mechanisms in MNS in ALS mice. Vos M, Esposito G, Edirisinghe JN, Vilain S, Haada DM, Slabbaert JR, Van Meensel S, et al. Vitamin K2 is a mitochondrial electron carrier that rescues pink1 deficiency. Science. 2012 Jun;336(6086):1306-10. Seyfried TN. Cancer as a mitochondrial metabolic disease. Front Cell Dev Biol. 2015;3:43. Alam MM, Lal S, FitzGerald KE, Zhang L. A holistic view of cancer bioenergetics: mitochondrial function and respiration play fundamental roles in the development and progression of diverse tumors. Clin Transl Med. 2016 Mar;5(1):3.